Install railing posts directly onto composite decks or concrete surfaces without 4″ x 4″ posts with a TimberTech® Secure-Mount post. 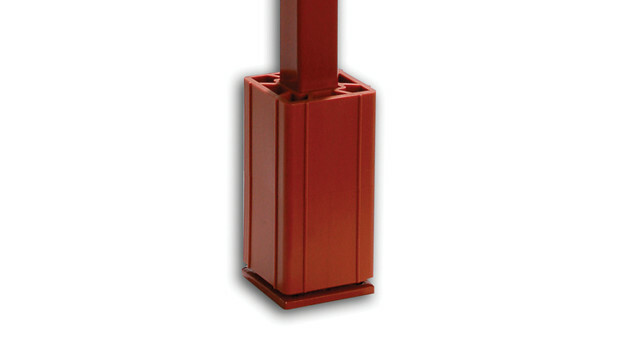 A six-inch adjustable top block allows for quick and easy extension from 36″ to 42″ posts. The optional deck mounting and leveling kit includes surface and bottom plates, leveling bolts, mounting bolts, washers, and nuts. Are the RadianceRail kits actually a full 6’ and 8’? All are designed to be 6’ and 8” or measured from center of post to center of post. The additional material is provided to allow for angles and end cuts/trimming. I have a chip in the cap stock (outer layer) material on my RadianceRail; can I repair it or touch it up? Yes. Automotive touch-up paint such as Duplicolor 2 in 1 Scratch Fix works well and is available at most department or automotive retailers - check out the full answer for our color recommendations. Will TimberTech decking and railing fade in color? Yes. Most materials exposed to UV and other weathering effects will fade - check out the full answer to tread how TimberTech decking and railing solutions minimize fade. Find videos, product guides and manuals, translated documentation, tips and more helpful technical resources for your project. TimberTech composite and capped composite decking offers the charm of traditional wood with long lasting durability, backed with 25-year limited warranties.